A barcode* is an optical machine-readable series of coded lines that help identify a product. The lines appear in one of several standard formats that are read and interpreted by a scanner. The scanner then converts the information it reads into a usable format (for example, item information entered on a item receipt). One advantage of a barcode system is that a large amount of information can be coded into a small space. There are numerous sizes and types of barcodes, but within each there is an accepted formula for the layout of the lines and spaces according to international standards that identify the pattern or type of barcode that a scanner can be programmed to read. Some things that might affect the reading of a barcode are the size of the lines and spaces of the barcode image, whether the edges of the lines are sharp or smudged, whether the surface the scanner is reading is flat, curved, or uneven, and whether a scanner is designed to read the particular size of the barcode. * Quick Response Code (QR Code) is different from a barcode. QR Code is NOT supported in QuickBooks Desktop. Advanced Inventory's barcode feature incorporates barcodes and barcode scanning seamlessly into your company file. Turning on the barcode scanning preference in Advanced Inventory and using the Barcode Wizard gives you the option of either moving your existing barcodes into QuickBooks Desktop into the new Barcode Number field for any or all of your items, or having QuickBooks Desktop create barcodes for items in your item list. You can also manually enter barcodes into the Barcode Number field through the Edit Item window. The barcode feature will automatically create barcode images for each of the barcodes entered. Once the barcodes are entered into your company file, you can use barcode scanning in most transactions. On the left pane, scroll down to Items and Inventory, then go to the Company Preferences tab. Go to Barcodes tab, choose Enable barcode, then select Open Barcode Wizard. In the Barcode Scanning Setup wizard, select what you want the wizard to do, then select Next. I don’t currently track barcodes in QuickBooks Desktop. Copy barcodes from the Item Name field. Copy barcodes from the Manufacturer’s Part Number. Copy barcodes from Purchase Information. You must designate which field the Barcode Wizard will search. If you do not have barcodes for some items, the Barcode Wizard can create them for you or leave them alone. While the wizard will copy the barcodes to the new barcode field, your barcodes will also be found in their original location. Any new items entered into the item list using the barcode feature will put the barcode for that item in the Barcode Number field, but not in the field you formerly used. You can then complete the details for the item in the New/Edit Item window. Decide if you want QuickBooks Desktop to create new barcodes for you. If you want the wizard to create them, check either the box that says All Items or individually select which items you want the wizard to create for you. Select Next and Finish, then OK on the wizard windows. Select OK twice to close the Advanced Inventory Settings and the Preferences window.. The Barcode feature with Advanced Inventory enabled is designed to work only with USB Barcode Scanners such as low-to-moderately priced hand-held thin beam laser barcode scanners that can be found at your local business supply store. Serial port scanners are NOT compatible with the new ES Barcode feature. The scanner must produce a single carriage return at the end of the barcode. The Barcode Scanner Tester App will check to see if QuickBooks Desktop will recognize your scanner. Download and run the Barcode Scanner Tester. Enter the information in Step 1, then select Analyze. Select Step 2, then select the blank field, scan any barcode, and select Analyze. You are ready to start using your scanner if you receive a success message. Note that you may have to redo the test if you move outside the app to another window on your computer. The bars that comprise the barcode image must be distinct and separate from each other in order to be read by the scanner. There must be at least one pixel width white space before and after the barcode. There must be at least one pixel width white space above and below the barcode. The barcode image cannot be blurry or distorted - the sharper the image, the less chance of visual noise interfering with the scanner picking up the individual bars and spaces. From the File menu, select Print Forms > Labels. In the Select Labels to Print window, select Item Barcodes and choose if you want to print for all or specific item(s), then select OK. Select the correct printer and printer type. From the Label Format drop-down, choose the appropriate label format. Set the Label Print Range. Specify the number of copies.NOTE: To print multiple items or multiple labels for each item, you have to either print all the items in sequence as many times as you need labels, or print each item individually. Once created, QuickBooks Desktop can display and print out your barcodes in several reports. NOTE: This feature does not support printing labels on a label printer or avery labels. To run, go to Reports > Inventory > Item Barcodes. This report does NOT need any customization. On the report, click the Customize Report button. Go to the Display tab and put a check mark on the following columns then select OK. Adjust the width of the columns to minimize blank spacing between columns so that only the necessary text is readable and maximize the Barcode Image column until the barcode is fully displayed. Select Print, then in the Print Reports window, choose Landscape Orientation. Put select Fit report to 1 page(s) wide. Select Preview to make sure barcodes are fully visible on printout. If the barcodes are not fully visible, close the preview and readjust your columns. If the barcodes are fully visible, print the report. On the report, select Customize Report. Move the Price Level Price column (ex.10% Discount Price) from the end to the right of the original price by placing the cursor over the name (it turns into a hand), left click to hold and drag column to where it needs to be. Put a select Fit report to 1 page(s) wide. Details: The Barcode Wizard does not copy existing barcodes located in specific fields into the new Barcode Number field. Possible reasons: The existing barcodes are not in a the format the Barcode Wizard can recognize. Quick Tip: The Barcode Wizard will copy the existing barcode from the field you designate. It will recognize and copy any alphanumeric (UPPER or lower case letters) characters. It will also recognize +, -, ., / (plus, minus, period, and the forward slash used in dates). Existing barcodes must have a value in the field between 5 and 30 characters. To avoid the issue, be mindful of the sample acceptable barcode formats that the wizard will recognize and copy. Change the existing barcodes into a format that the Barcode Wizard can recognize. Details: The prompt asking to remove the barcode from the original item and add it to the new item does not work if a barcode assigned to an item is entered into another item. Edit the original item and give it a new barcode number. Give the new item a barcode number different from the original. From the Lists menu, go to Item List. In the Item List, highlight the item you need to change the bar code for. Right-click the item and choose Edit Item. Change the barcode in the "Barcode Number" field then select OK. Details: The USB barcode scanner does not scan coupons or other media with barcode images that have been copied from an original and printed. Has lines and white spaces that are clear and sharp. Is printed using the high quality setting on the printer. Has not been scaled or resized during the copying process. Details: Barcode scanner is not recognized or fields are not auto populating information from a scan using the Barcode Scanning feature. QuickBooks does not recognize the scanner. QuickBooks is accessed through a virtual networking computer (VNC) environment. QuickBooks detects the value you are scanning is not a serial or lot number. It is treating it like a barcode versus other. Click into the specific field(s) with the cursor in order to scan barcodes or serial number/lot numbers. Select the item field and scan to populate the item. Optional - Manually adjust quantify if needed. Barcodes - Select the barcode field and scan to populate the barcode for the item. Serial/Lot Numbers - select the serial/lot number field and scan to populate the number for the item. If you see the following message: QuickBooks did not find your item in your list of products and services, you may need to manually enter the serial/lot number. QB:xxxxxxxxxxxxx cannot be added. QuickBooks cannot add more than one level to the Item List at a time. Possible reason: Your Company Preference for Barcode Scanning under Advanced Inventory is not selected. 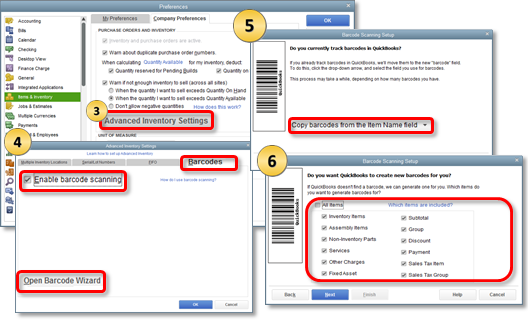 QuickTip: Follow the steps outlined in this article for enabling barcode scanning. Manually edit the barcode for each item in the Item List. Use the Add/Edit Multiple list window to edit the barcode. Export your list to ExcelYou can export your list to MS Excel, make modifications then import it back in. This may be the best option if you have 500+ items with barcodes generated by QuickBooks.IMPORTANT: The instructions provided are intended for users with some knowledge in using Excel and for QuickBooks users with Admin access to export/import into the company file. Here are a few things to keep in mind:You should attempt the following steps in a copy of the file before you made these modifications in your working company file. Importing into QuickBooks requires you to be in single-user mode. Create a QuickBooks backup before any changes are made. A new custom field will need to be created in QuickBooks. Note: If you are using all custom fields QuickBooks allow, you will not be able to perform the following. Open Item List and double-click any item. In the Edit Item window, select Custom Fields. Select Define Fields, enter a Label, select List, and choose Any Text for What kind of data?. In this example, we will use Barcode2. It is not necessary to select any option for Use or Trans. Select OK, then customize the columns and add the Barcode and Barcode2 to the list. Open the Item List and at the bottom and select Export > Export All Items. In the Export window, select Export. Excel will open with your items. In Excel, copy all the information from Barcode column to Barcode2. Save the Excel file and close it. In QuickBooks, go to File > Utilities > Import Excel Files. On the right side, choose Advanced Import. Browse to the Excel file, select Sheet 1,map out the headers for Items in the Choose mapping and continue to import. Go to Edit > Preferences, then select Advanced Inventory Settings for Items & Inventory. On Barcodes tab, Open Barcode Wizard. In the drop-down arrow, choose Copy barcodes from Custom field 'Barcode2'. Continue through the wizard to select Finish. You may see a window that tells you how many barcodes were created. Open the Item List and notice the Barcode for your items is showing. Item Not Found: QuickBooks did not find item name in your list of products and services. Quick Tip: QuickBooks has certain rules on identifying serial/lot numbers when using a barcode scanner. Take note that serial/lot numbers must follow these rules. Does not look like a UPC/EAN - codes that contain all numeric characters between 6 and 13 characters long. Must be between 5 and 30 characters that contain alphas, numerical, dash (minus), plus, period (dot), colon, and slash ( / ). Must NOT have any spaces. This is a limitation with serial/lot numbers. Must NOT be generated numbers from QuickBooks. If your serial/lot numbers don't follow the QuickBooks rules on identifying them, you need to manually enter them in the field instead of using the barcode scanner.